(Nanowerk News) Uncomfortable, rigid, with low air permeability: textile materials capable of conducting electricity can be awkward for day-to-day use. However, researchers at the University of Bayreuth, Donghua University in Shanghai, and Nanjing Forestry University have now developed new nonwoven materials that are electrically conductive as well as flexible and breathable. This paves the way for comfortable high-tech clothes which, for example, convert sunlight to warmth, supply wearable electronic devices with electricity, or contain sensors for fitness training. The scientists have published their findings in the journal npj Flexible Electronics ("Polymer nanofibre composite nonwovens with metal-like electrical conductivity"). Prof. Dr. Andreas Greiner’s team of researchers at the University of Bayreuth and their Chinese partners have succeeded in producing electrically conductive nonwovens which have all the other characteristics you would expect from clothing that is suitable for daily use. The materials are flexible, and thus adapt to movements and changes in posture. In addition, they are air-permeable, meaning they do not interfere with the natural breathing of the skin. 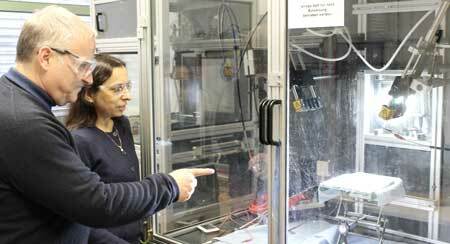 Prof. Dr. Andreas Greiner (left) and Prof. Dr. Seema Agarwal (right) with equipment for electrospinning at the University of Bayreuth. With backlighting, one can see the thin fibres from which nonwoven materials are formed. The combination of these properties is based on a special production process. In contrast to common methods of production, metal wires were not inserted into finished textiles. Rather, the scientists modified classical electro-spinning, which has been used to produce nonwovens for many years: short electro-spun polymer fibres and small amounts of tiny silver wires with a diameter of only 80 nanometres are mixed in a liquid. Afterwards, they are filtered, dried, and briefly heated up. If the composition is right, the resulting nonwoven material exhibits a very high degree of electrical conductivity. This opens up a whole range of possibilities for innovative applications, especially in the area of smart clothes (i.e. wearables). Everyday clothing, for example, can be equipped with solar cells such that the captured sunlight is converted to warmth, heating up the textiles themselves. Mobile phones, cameras, mini-computers, and other wearable electronic devices could be charged by plugging them into the textiles. Sensors installed in the clothes could provide athletes and trainers with important fitness and health data or could give family and friends information on its location. “In addition to articles of clothing, similar functions could also just as easily be installed in textile materials for use in seats and instruments in cars or airplanes,” explained Prof. Dr. Andreas Greiner, Chair of Macromolecular Chemistry II at the University of Bayreuth. “Our approach, which takes the production of conductive textiles as its basis, can in principle be applied to many different systems,” added Steffen Reich, doctoral researcher and lead author of the new study. As an example, he cites current Bayreuth research projects on microbial fuel cells, which could eventually be used as electrodes in such nonwoven materials. The research findings that were published in npj Flexible Electronics resulted from close cooperation between the University of Bayreuth, Donghua University in Shanghai, and Nanjing Forestry University. It was only two years ago that the University of Bayreuth signed a cooperation agreement with Donghua University, which has had a research priority on the research and development of textiles since the establishment of the institution. The mutual exchange in research and teaching that was agreed on is now beginning to bear fruit.